If you are interested in results containing video, Ezy allows you to further refine your search by selecting a specific type of video. You can do this through the Content Type section in the Advanced Filtering Panel. Embedded refers to videos hosted by third parties like YouTube or Vimeo. 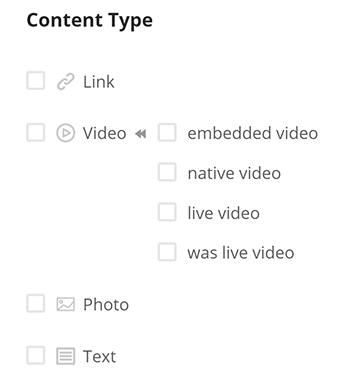 It also covers links to websites that contain video content. Native refers to videos uploaded directly to the social network. Live video is currently being played, whereas "was live" means that the publisher broadcasted a video that has ended. You can of course select just "Video" to include everything.